If you need to use a towing service after a crash, make sure you understand your rights and responsibilities. As part of the NSW Police commitment to streamline processes for motorists, reduce danger to road users and manage crashes more efficiently, motorists involved in tow-away only collisions can organise their own tow and leave the area if no one is injured, all parties have exchanged particulars and no one is under the influence of drugs or alcohol. The crash must later be reported to the Police Assistance Line on 131 444. Drivers no longer need to report minor collisions which do not require a tow away, even for insurance purposes. Visit the NSW Police website for more information. receive a quotation for the cost of the towing work from the tow truck driver. All of the costs involved are explained to you (tow fee, excess km, salvage, storage and the surcharge outside business hours). If your vehicle is covered by a comprehensive insurance policy, the towing fee may be covered in your claim. You should check with your insurance provider. It is your right to choose who will tow the vehicle, where the vehicle will be towed, and to authorise the tow truck driver to tow your vehicle. If you’re unable to give this authorisation, a Police Officer or authorised officer will make the decision. All accredited tow truck drivers in NSW must wear a tow truck drivers certificate whenever they are driving or operating a tow truck. A sample drivers certificate is shown below. Only tow trucks with a “TT” number plate with four numbers before the “TT” (as shown below) are authorised to tow your vehicle from the scene of an accident. Tow trucks with three numbers followed by TT are not authorised to collect vehicles from the scene of an accident. 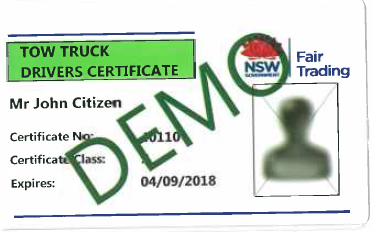 An interstate tow truck that is authorised to carry out towing work in NSW will have a registration plate issued in their home state and two NSW Fair Trading interstate tow truck signs in the windows of the truck. Note: If this is not the case, do not allow the tow truck to tow your vehicle. The charges are effective from 15 December, 2018.
the listed charges exclude any applicable GST. this summary document is provided as a quick reference guide only, for full details please refer to Part 4A of the Tow Truck Industry Regulation 2008. Class 3 Conventional Tow Truck GCM 18 to 25 tonnes 257 234 159 Inclusive of all travelling costs. Class 4(A) Tow Truck GCM 25 to 45 tonnes 278 255 183 Inclusive of all travelling costs. Tow Truck must have dual rear axle. Class 4(B) Tow Truck GCM 45 to 60 tonnes 292 269 196 Inclusive of all travelling costs. Tow Truck must have dual rear axle. Class 4(C) Tow Truck GCM 60+ tonnes 371 348 277 Inclusive of all travelling costs. Tow Truck must have dual rear axle. 2nd Certified Driver 65 Per hour - for the period at the accident site. For the cost of salvage operations after the first 30 minutes at an accident scene 88 Per hour - excludes the use of a tow truck. Stand by rate 50% Of the hourly rate applicable to the type of tow truck used. Administration/Site Coordination rate $64 Per hour - payable for one driver only per accident/incident. Surcharge for service outside business hours 50% Surcharge payable on labour costs only outside business hours (8am-5pm). All additional equipment required to complete the tow/salvage/site recovery 10% Above the actual cost. Only applies if arranged and paid for by the tow truck operator. Storage after 72 hours 97 Per day - payable only where the vehicle is stored awaiting collection in an authorised holding yard. Not claimable if the vehicle is awaiting repair. Surcharge outside business hours 20% Business hours defined as 8am to 5pm Mon to Fri excluding public holidays. *Business hours defined as 8am to 5pm Mon to Fri excluding public holidays. If you have any questions about tow truck services, or would like to make a complaint, contact NSW Fair Trading on 1300 131 134 and select option ‘2’ between 8.30am and 4.30pm Monday to Friday. We recommend you print this page and keep it in your car next to the contact details for your insurance provider.